At Koley Jessen, it is our passion for making our clients’ concerns our own that drives us to succeed for them. As active partners, we stay connected, engaged, and attuned to our clients’ industries and operations and work around the clock to provide efficient and effective legal solutions. 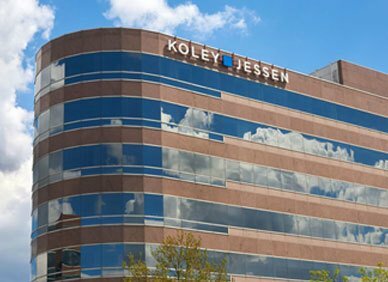 Koley Jessen is an aggressively growing law firm serving the needs of business owners, executives, and professionals around the country. As a multi-discipline firm, we serve a wide variety of legal needs. Our team encompasses over 70 attorneys. With extensive and diverse expertise, we work as a team, utilizing each other’s knowledge and skills to provide well-rounded legal advice to help our clients achieve personal and business success. Since our inception in 1988, we have had the privilege of representing a diverse clientele throughout the Midwest, the United States, and the world in a variety of legal matters. Our clients include individuals in need of basic estate plans, high net worth individuals needing complex succession strategies, public and private companies, private equity funds, family offices, start-ups, closely-held businesses, and health care organizations. "While the firm has grown from 5 to 70 attorneys in only 30 years, we have stayed true to our roots. Culture is very important to us. Since the beginning, we have been focused on being a great place for people to work and providing over-the-top service to our clients."